In July 2017, artist Christine Gagné, decided to do a family vacation with her parents. Christine is 42 yrs old and has been a visitor of Algonquin Park for the past 25 years. She wanted to show her parents everything she loved about the park. This year is the celebration of famous Canadian artist Tom Thomson’s 100th anniversary, Canada’s 150th anniversary, Algonquin Outfitter’s 56th anniversary and Christine Gagné’s 25th celebration of being a visitor and friend of the park. 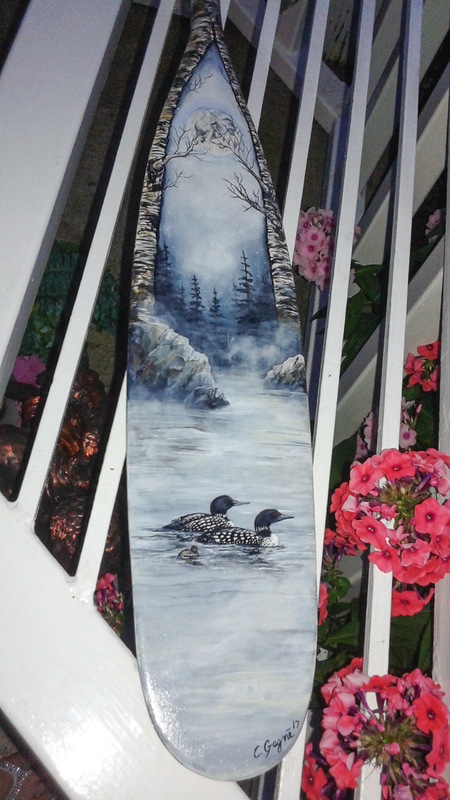 While booking the vacation getaway online she came across the Tom Thomson Paddle Art Contest. She was very excited as Tom Thomson was one of her inspirations to create her art in her high school years to present. Christine knew in her heart the paddle would have to be purchased at Algonquin Outfitters. 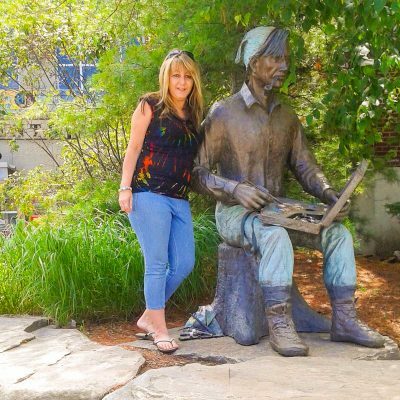 It had to be fitting within the Algonquin theme yet with a twist of Tom Thomson’s love for the park with a calm, serene feeling she felt every time she visited the park. 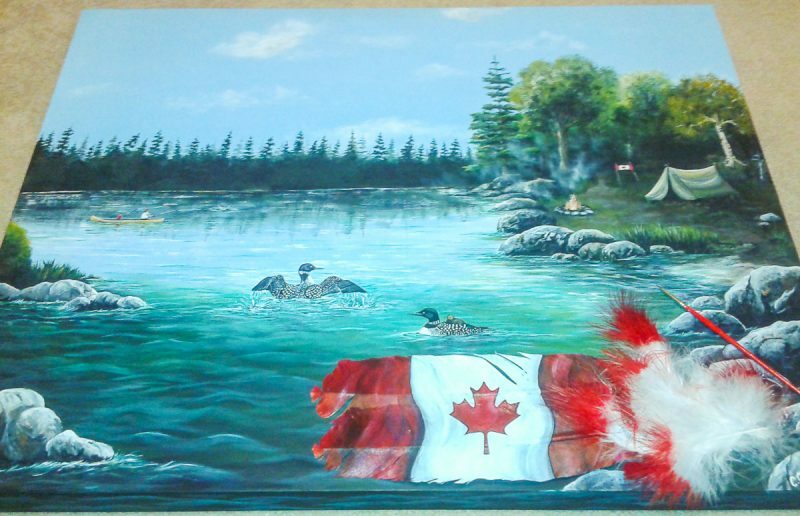 “The Journey Begins” is hand painted with Acrylics by Artist Christine Gagné from London, Ontario. First stained with dark walnut to show the beautiful grains of the wood of the hand crafted paddle. The birch trees are in memory of Tom Thomson mysterious death in Algonquin Park. The tiny branches wrapping and twisting around to the top of the grip of the handle. 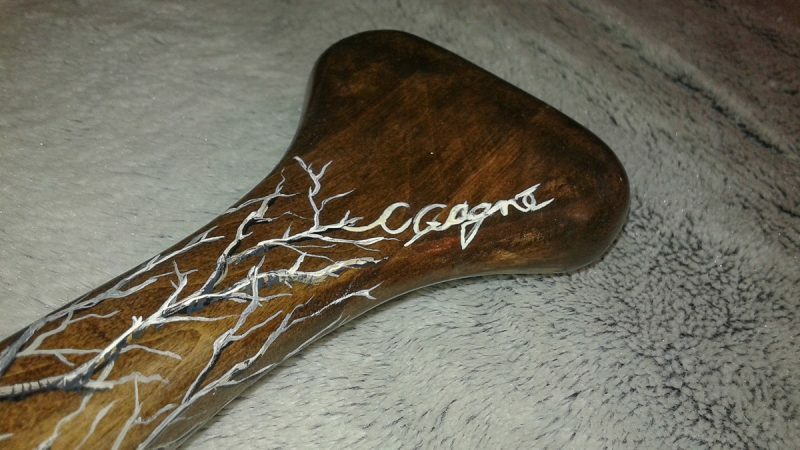 Her signature can be seen at the tip top of the branches on the top of the handle. On one side of the paddle shows the night skies with the moon mirroring it’s reflection on the water. The mist rising and lifting from the lakes is a magical moment of silence. The echoing of the loons across the water with their chick grasping for a ride on one’s back, the billions of stars and Milky Way on a clear night make us wonder who we really are. On the other side some of Christine’s common encounters over the years with wildlife in the park. The bear, moose and the wolf howling in the night are her favourite animals of Algonquin Park but loves them all. 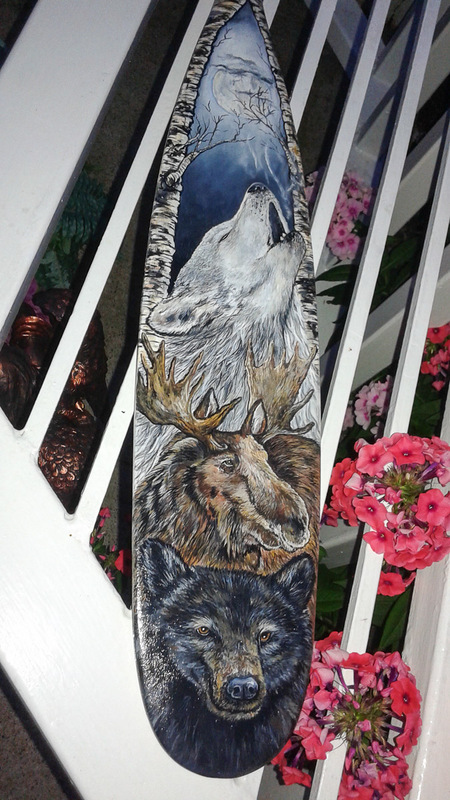 Artist Christine Gagné’s reviews on her paddle say “stunning art” and for that she is grateful she has taken part in Algonquin Outfitter’s, Tom Thomson Paddle Art Contest, to help raise funds for Oxtongue Lake for Arts and Culture and Town of Huntsville Fund for Future Acquisition of Public Art. 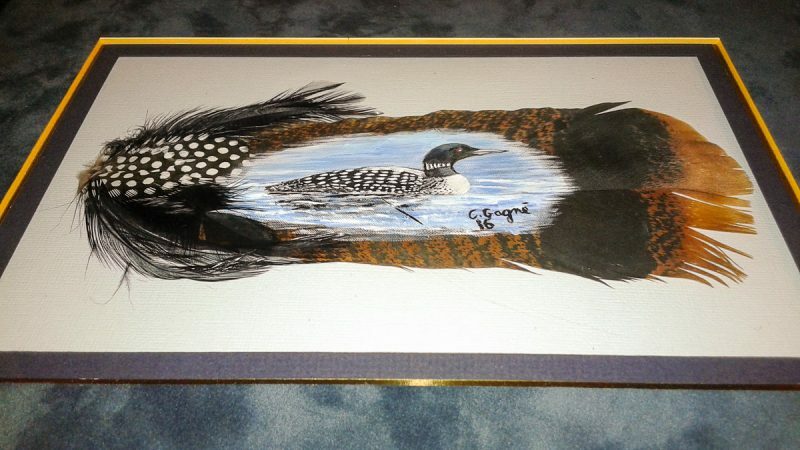 Her dream goal is to become an artist of Algonquin Park so visitors can view her artwork from around the world. Her last visit to the park was a very special memory she’ll cherish forever as many others with her 2 sons and friends. 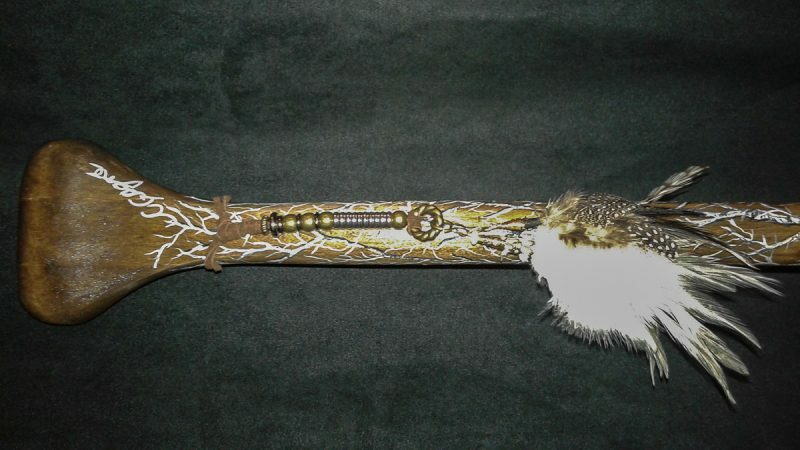 The feathers are attached to the paddle with good luck wishes from family and friends. Where have u been missed your smile!